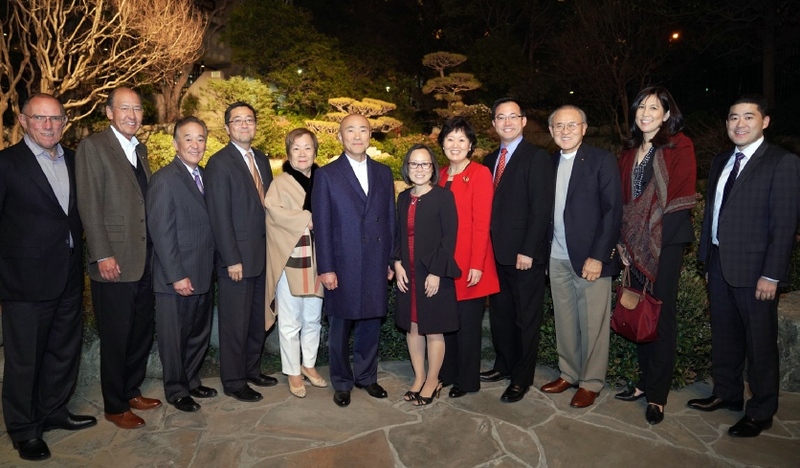 Mr. and Mrs. Toshizo (Tom) Watanabe with JACCC board members at the opening night of the Los Angeles premiere of “Allegiance.” Pictured from left: Jeff Folick, Thomas Iino, Gerald Fukui, George Tanaka (JACCC immediate past chair), Hidemi Watanabe, Toshizo Watanabe, Leslie Ito (JACCC president and CEO), Bette Hiramatsu, Glenn Inanaga, Henry Ota, Jean Miao, Craig Tomiyoshi (JACCC chair). The Japanese American Cultural & Community Center has named its culinary center the Watanabe Culinary Cultural Center in recognition of a $2 million lead gift from The Toshizo Watanabe Foundation to JACCC’s culinary initiative. The Watanabe Culinary Cultural Center will be an exhibition and learning center highlighting Japanese cuisine, culinary talent, food and beverage products, and other culinary products. It will be connected with the James Irvine Japanese Garden on JACCC’s campus, in the heart of Little Tokyo; and as a part of the dynamic and growing Downtown Los Angeles, it is an optimal location for launching a new culinary concept. Additional major supporters for the Watanabe Culinary Cultural Center are Hoshizaki America, Ken and Jo Ann Hamamura, Suntory Holdings Ltd., Joachim Splichal, and Pasona NA, Inc.